As I sit here finishing my ice cream bar...definitely the chocolate-covered strawberry bars would be a hit with my family! Chocolate chip sounds very yummy right now! Thanks for the giveaway! I think the Chocolate Covered Strawberry Bars look absolutely delicious! Thanks for the review and giveaway! I'd like to try the vanilla caramel chip. Thanks for the chance. I think the Vanilla Fudge Brownie sandwiches sound good. I know my daughter would love them! I love to use Breyer's vanilla ice cream in root beer floats. Yum! The chocolate chip sounds yummy. My daughter would love the Chocolate Chip Cookie Dough cookie sandwiches! Thanks! The triple chocolate chip ice cream bars are only 130 calories a piece. I like their vanilla bean ice cream. Yum! I think my husband would really like the Vanilla Caramel Chip bars. 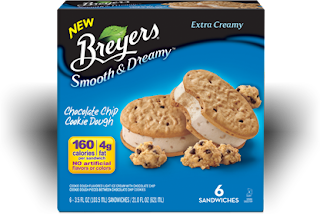 My daughter's favorite would be the Chocolate Chip Cookie Dough cookie sandwiches. The Vanilla Caramel Chip bars sound delicious! Those Chocolate covered strawberry ones look AMAZING!!!! I'd love to try the Dark Chocolate Velvet ice cream. It's a chocoholic's dream!